Hveragerði is right on the Ring Road #1, roughly 45 km east of Reykjavík. There, STEYPA is being held at the „Acricultural University of Iceland“ (Garðyrkjuskólinn Reykjum) in a greenhouse among exotic plants. 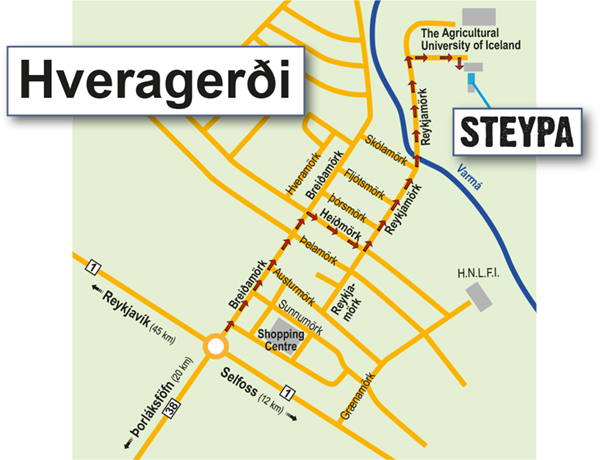 The school is located right behind the swimming pool and campsite at the end of the road “Reykjamörk”. Acricultural University of Iceland: visit their homepage! Following photographers show in the greenhouse in Hveragerði: Anna Grevenitis, Claudia Kerns, Claus Sterneck, Frédérique Larousserie, Gabrielle Motola, Julia Kozakiewicz, Nanne Springer, Thomas Verfaille and Valdimar Thorlacius.